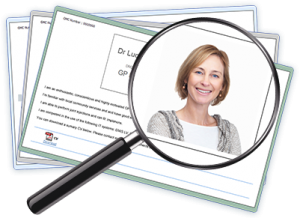 …our partnership with Lantum means you can see available Lantum jobs directly within your Locum Organiser diary. You set the radius in which you want to work. The number of available Lantum jobs within range is shown for each day in the diary. If you wish, you can click the number to see further details and apply for the job on the Lantum site, and receive additional benefits such as e-pensions and automated invoicing for no additional cost. 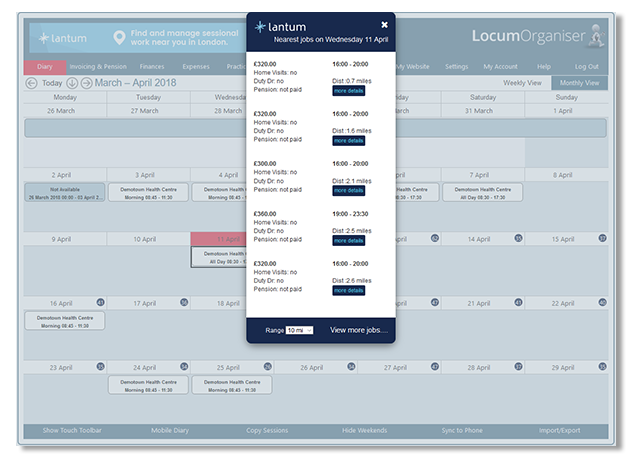 Only Locum Organiser has this feature, and if you work through Lantum your LO subscription automatically becomes cheaper! …we can give you some tools to market yourself. You can quickly create a personal website with a profile page, an availability calendar and a contact page. Your website has a personal address which you can give out to practices (and on your CV). 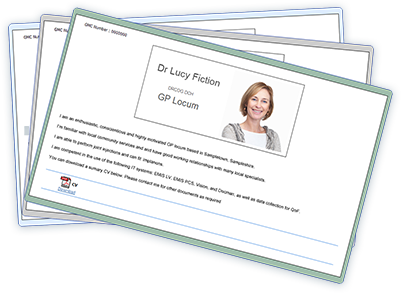 The practice can then go directly to your site to see when you’re available for locum work. …we hope we can bring some work to you. We have over 2,000 practices registered with us to find locums. 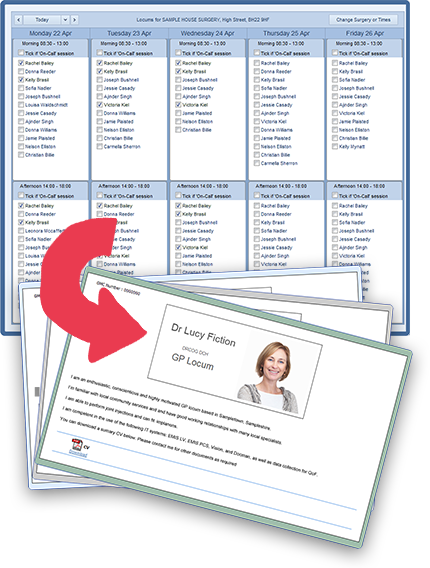 When searching for locums, the PM sees a calendar showing all those who are available for their chosen session times (by reference to the locums’ diaries) and who are also willing to travel as far as their surgery (as each locum specifies a commuting radius). The PM can then click through to the locum’s own website (as above) and contact them directly to arrange a booking. Don’t forget, we’re not an agency, we don’t handle your money and we don’t accept bookings on your behalf, we just act as a point of contact – you decide who to work for and you set your own terms. Practice managers will have to register with their NHS practice code and NHS email address to see your site – but it’s free for them to use our services. They often spend significant time looking for independent locums. It’s a chore for them but it’s still worth their while, to save on agency fees. So, as an independent locum, if you’ve got your availability online, it can be such a time-saver that, hopefully, they’ll come to you first when they need a locum. If you feel you have all the work you can handle, you can simply turn these tools off.